On my first ever trip to sea in 1999 on the scientific research ship ‘Challenger’ we were investigating an area of the Irish deep sea known as the Porcupine Seabight at about 1300m, as part of a long term research programme monitoring the animals that live on the seabed. When our fishing net (an otter trawl with an 8m wide opening) returned to the ship it was stuffed full of what looked like hundreds of fluffy tennis balls. I was amazed and excited to see our catch. The Senior Scientist however looked dismayed and his comment was something like “we’ve hit a sponge field, that’s not good”, he then explained to me what I will now recount to you. The fluffy tennis balls were in fact a deep-sea sponge called Pheronema carpenteri, a glass sponge that lives in big groups spread out across the sandy and muddy sea beds with densities of up to 15 animals 10m2. 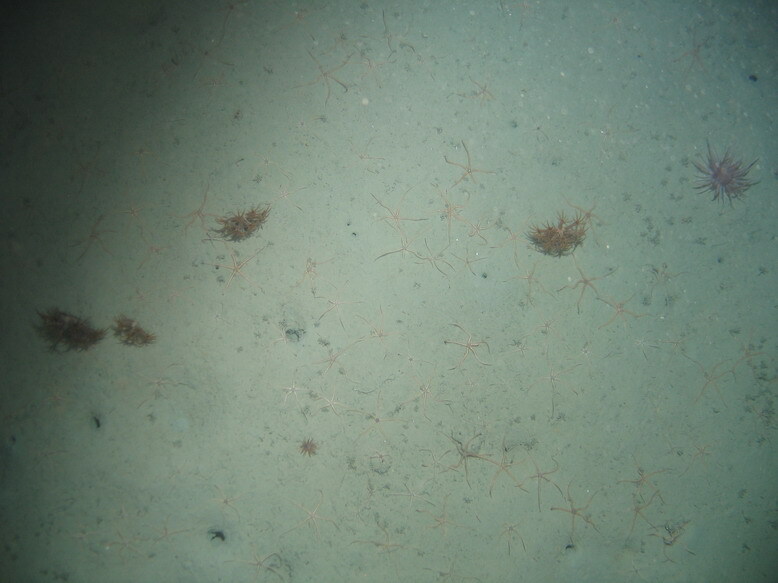 A Pheronema carpenteri deep-sea sponge field in the Hatton-Rockall Basin, NE Atlantic. Image copyright © National Oceanography Centre, Southampton, UK 2011. Just like a coral reef, the sponges provide shelter for other animals that live in, on, or around them. 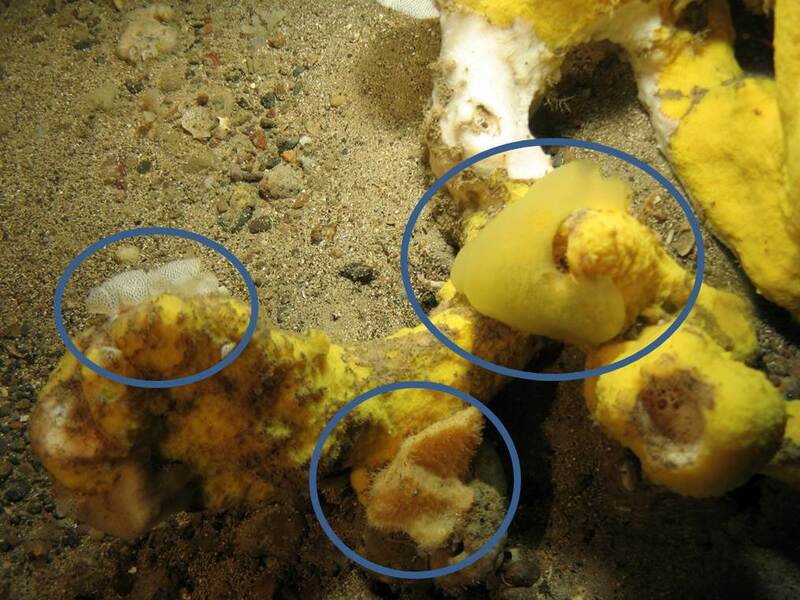 The sponges have hairs (spicules) that fall off and slowly over hundreds of years build up into mats on the seabed. These mats trap food and also provide an important habitat for smaller animals. In this way, these sponge aggregations support both more animals and more species per square metre than the same type of sea bed with no sponges present. A squat lobster hides inside a Pheronema carpenteri deep-sea sponge. Image Crown copyright © 2006. Crabs and fish also like this spongy habitat. Image Crown copyright © 2006. So these sponge habitats are important, and as I had learned the hard way, are very easy to destroy with a single pass of a bottom trawl. 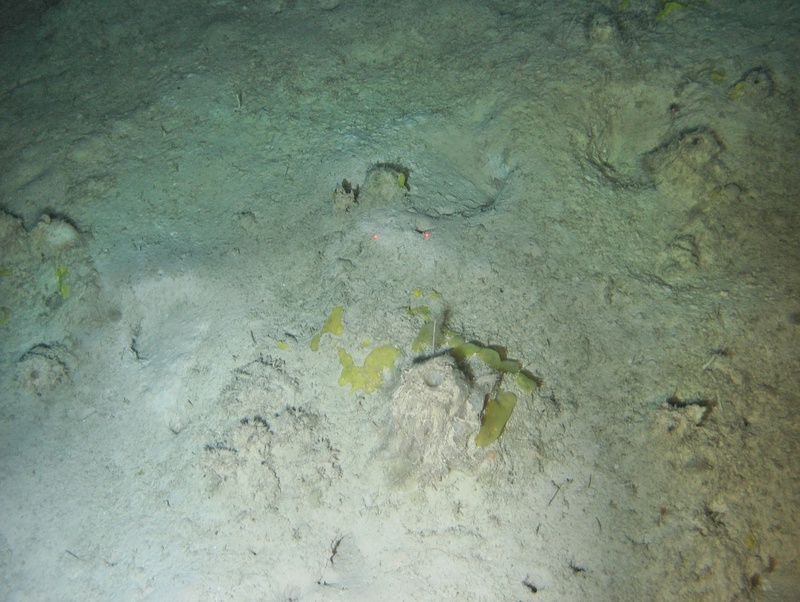 It was heart-breaking to see hundreds of sponges tumble out onto the deck along with the myriad other species associated with them, as we opened the net; but we recorded all the information we could to help us learn as much about this habitat as possible, marked the position on the chart, and avoided the area from that point forward. This incident had a major impact on me and I started to wonder, what other kinds of habitat might be down there. Well, 14 years later we can now recognise and describe many other types of habitats on the fine sand and muddy deep-sea bed. This is at least in part thanks to technological advancements that have allowed us to use cameras and imagery in deep-sea science. I would like to now share with you a small part of what we have learned. Deep sea sponge beds are important habitats, and Pheronema carpenteri fields are not the only kind of deep-sea sponge beds down there. In the deep channel between the Faroe Islands and the Shetland Islands at about 500m down is a type of sponge bed known by Danish fishermen as ‘ostebund’ or ‘cheese bottoms’. Just like the Pheronema fields the ‘ostur’ provide habitat for other larger species like fish, crabs, brittle stars and lace corals, as well as the spicule matt providing habitat and food for much smaller creatures like nematode worms. 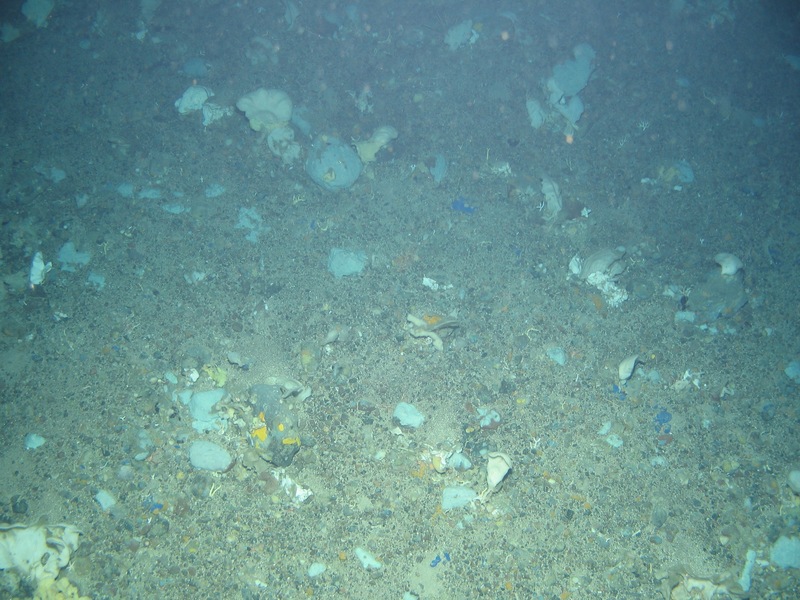 Sponges dominate the sea bed at 500m down on the continental slope west of Shetland. This habitat is known as ‘ostebund’ or ‘cheese bottoms’. Image Crown copyright © 2006. Some of the other kinds of animals that live on the sponges within the ‘ostebund’ habitat. Image Crown copyright © 2006. A fish shelters from our camera inside a cup-like sponge on the bottom of the Faroe Shetland Channel. Image Crown copyright © 2006. Sea pens are another example of a deep-sea animal which itself provides a habitat for other creatures. Sea pens are a type of soft coral, so called because some species resemble the old quill feather pens. They tend to live on soft muddy sea bed anchored in by a bulbous root or peduncle. Sea pens can occur individually, but are most often encountered occurring together in large numbers. And different species of sea pens occur at different depths. 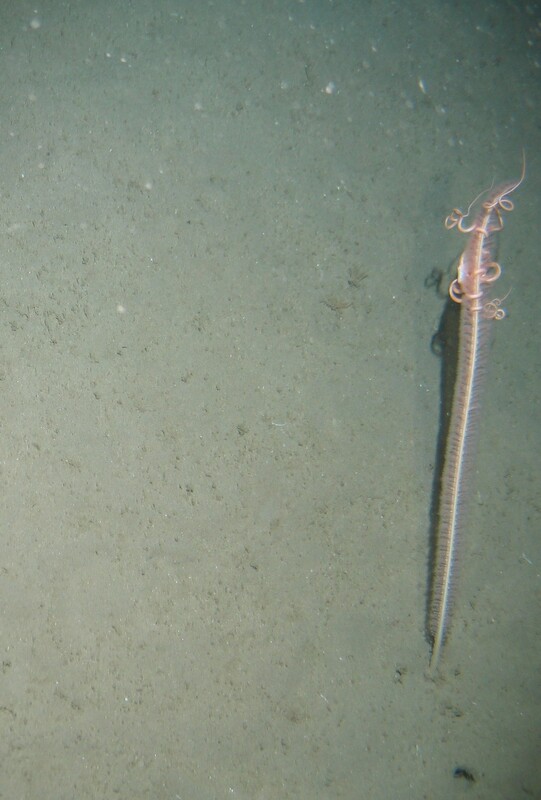 In shallower deep-sea (200m) you tend to get species like the Tall sea pen (Funiculina quadrangularis) and the Phosphorescent sea pen (Pennatula phosphorea), which, as its name suggests, glows in the dark. In deeper water we get species like Kophobelemnon stelliferum (200-1000m) and even deeper, species like Umbellula and Halipteris. Sea pens, just like many other coral species, tend to have ‘associates’, species that live on them such as the Pipe-cleaner brittlestar Asteronyx loveni. 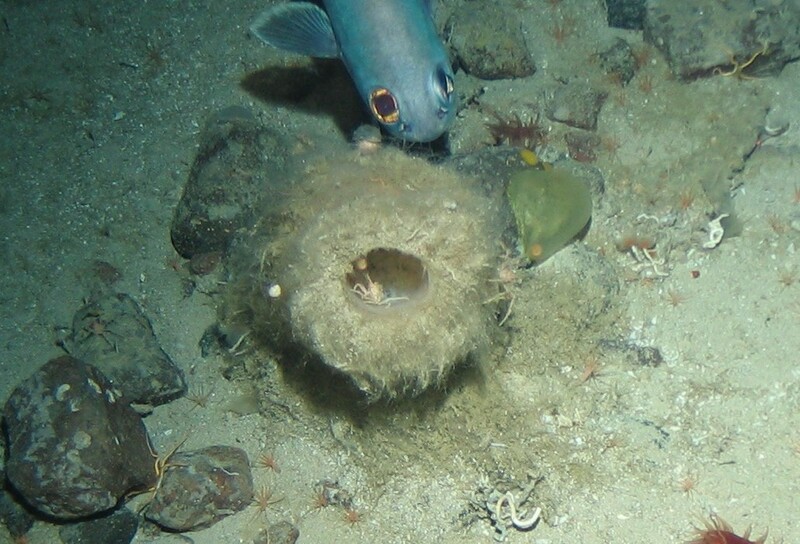 We also know that sea pens are an important nursery habitat for some fish larvae. The Tall sea pen (Funiculina quadrangularis) and its associate the Pipe-cleaner brittlestar (Asteronyx loveni). Image Joint copyright © Defra, JNCC, Marine Institute, BGS, UoP, 2007. 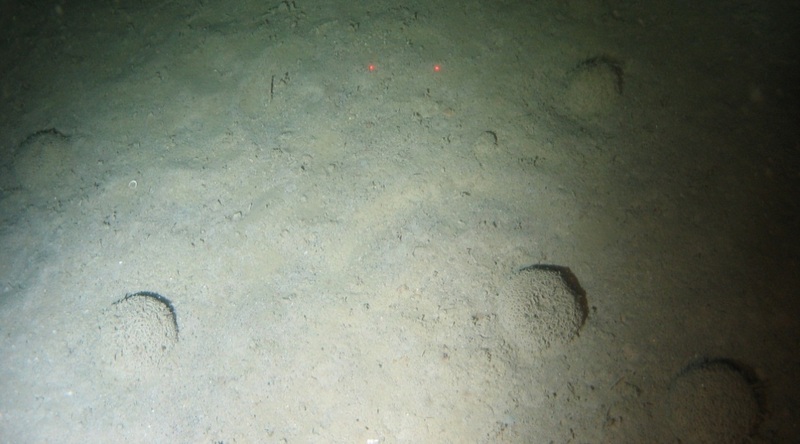 A sea pen field from the continental slope in the south-west area of the UKs deep sea, composed of the Kophobelemnon stelliferum. Image Joint copyright © Defra, JNCC, Marine Institute, BGS, UoP, 2007. 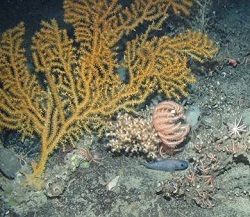 Xenophyophore fields are widely accepted as another important deep-sea habitat. Xenophyophores are incredible, an organism that is a single cell, and yet is the size of a cricket ball. These animals live on soft muddy seabed in aggregations, a bit like the fluffy tennis ball sponges. They are found from 860-1830m deep, although most records are at around 1000m deep. Xenophyophores provide a habitat for other animals to live on, they can provide a refuge from predators, or nursery areas for juvenile fish. Xenophyophores are extremely fragile and so don’t make it up to the surface in bottom trawl nets. A close up view of some Xenophyophores from the Darwin Mounds Special Area for Conservation on the UK’s continental slope (depth ~1000m). Image copyright © National Oceanography Centre, Southampton, UK 2011. A Xenophyophore field from the base of Rockall Bank. Spot the Xenos! Copyright © Joint Nature Conservation Committee, 2009. All of these animals that don’t move (sessile animals), and grow together in dense aggregations, provide habitat for other species. On land it is plants that have this role, they provide the habitat, the three dimensional structure that other animals then use to live in, on or around. In the deep sea where there is no light and so no plants, it is sessile animals like corals, sponges and xenophyophores that are the habitat (as well as the sea bed itself). 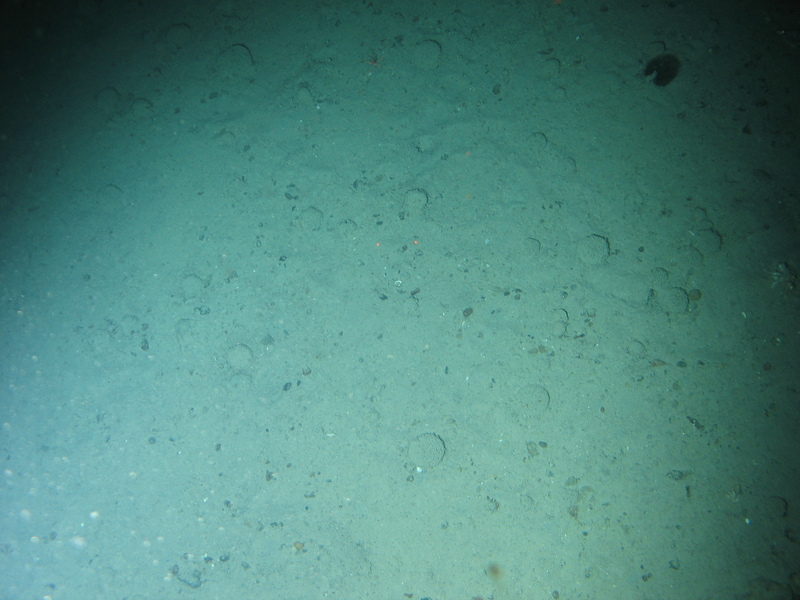 All of these habitats I have described are found on soft bottom seabed in the North East Atlantic deep-sea. 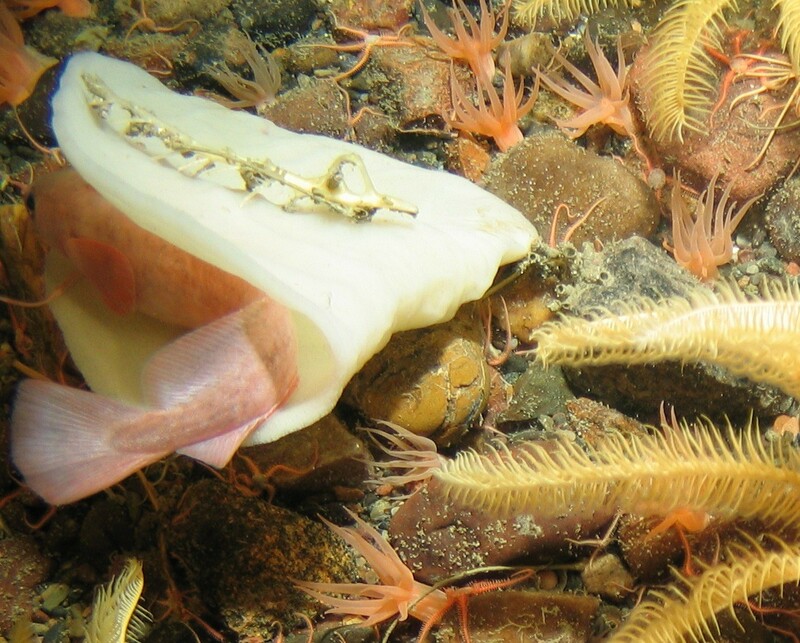 The sandy and muddy deep-sea bed is often described as a biological desert, devoid of interesting life – as opposed to rocky habitats. However, as you can see it is far from this. Recognising the habitats and sea life of the muddy and sandy sea bed is vital to their conservation and sustainable management. And what is wrongly perceived to be a desert, could very well become this if we (as society) are not careful about managing where we allow human activities to go on. Activities such as bottom trawl fishing, oil and gas exploration, and deep-sea mining all have the potential to damage these fragile marine habitats. Our research project Mapping the Deep is working to describe and map the distribution of deep-sea habitats, so that we can better manage our marine area and hopefully avoid damage of these and other as yet un-described habitats. However, until we do have good data on what habitats are down there, where they are, and their role in the ecosystem, it might be sensible for us to be more cautious about what human activities we allow to be carried out in the deep-sea. Kerry is absolutely correct, we seemed to have lost interest in many deep-sea habitats, I too have been lured into cold seeps! The Pheronema ground is very interesting and highly diverse. I have described two new genera of bivalves from this habitat, Draculamya and Atopomya and examining samples in Southampton suggests there is much more to do. I have been on Norwegian Mareaono cruises when they have hit sponge grounds, truly spectacular, log into the Mareano site to see lots of images.